Chuck Clark, a resident of tiny Rachel, Nevada -- 100 miles north of Las Vegas along the Extraterrestrial Highway -- the amateur astronomer and author has spent years keeping an eye on the spot the government calls the "operating location near Groom Lake, Nevada. He's said to be a frequent presence at the Little A'Le'Inn, where you can purchase post cards and tee shirts, enjoy an "Alien Burger," and walk out with a copy of Clark's "Area 51 & S-4 Handbook" to guide you on your journey into the desert. But this self-appointed military watchdog is harder to find these days: messages left for him at the Inn go unreturned, and his media appearances have dried up like Groom Lake itself. "I think he's really not as motivated to talk to the media anymore as he used to be," says friend and fellow base-watcher Joerg Arnu. The reason: it turns out the truth really was out there, and the government didn't appreciate Clark digging it up. Clark didn't find the Roswell craft or an alien autopsy room -- in fact, while officially shrouded in secrecy, the 50-year-old base is generally believed to be dedicated to the terrestrial mission of testing classified aircraft. 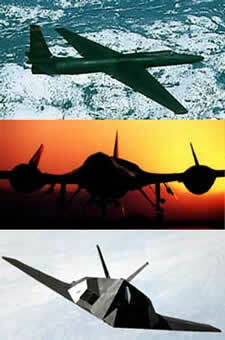 "The U2 spy plane, the SR-71, the F-117A stealth fighter, all were flight-tested out of the Groom Lake facility," says Steven Aftergood, director of the Federation of American Scientists' Project on Government Secrecy. The myth of Area 51 memorialized in films, T.V. shows and novels is a function of the secrecy that surrounds it. "It is a concrete manifestation of official secrecy at its most intense, and that invites a mixture of paranoia and speculative fantasy that has become ingrained in popular culture," says Aftergood. Even without aliens, the facility has its secrets, and last year while roaming the desert outside the Groom Lake base Clark stumbled upon one of them: an electronic device packed in a rugged case and buried in the dirt. Marked "U.S. Government Property," the device turned out to be a wireless transmitter, connected by an underground cable to a sensor buried nearby next to one of the unpaved roads that vein the public land surrounding the base. Together, the units act as a surveillance system, warning someone -- somewhere -- whenever a vehicle drives down that stretch of road. Similar devices had been spotted in the area in the early 90s, but they were crude and bulky, stashed in the bushes and easily spotted. They were later withdrawn. The new road sensors are more clandestine, given away only by a slender antenna poking up through the dirt. "They're very, very hard to find, because there's just this little wire, like a blade of grass," says Arnu. Arnu, a Las Vegas software engineer, has shared Clark's preoccupation with the Groom Lake base since 1999, when he made a trip to the area to see what all the fuss was about. "I thought, okay, I'll give it a try, see what's out there... A couple of days turned into a couple of weeks and before I knew it I started developing a website about Area 51," says Arnu. So when Clark found the new generation of road sensor, Arnu drove out to help investigate further. The pair found that, at close range, they could use a handheld frequency counter to pick up the wireless signals given off by the devices as a car passes. Over the following month and half, Clark and Arnu engaged in a kind of geocaching game with the Men in Black, systematically sniffing out the road sensors with the frequency counter, exhuming them, and opening them up. They discovered that each device was coded with three-digit identifier that could be read off an internal dial, allowing Arnu to make a list that correlated each unit's I.D. number with its GPS coordinates, creating a virtual map of a portion of the surveillance network surrounding the Groom Lake facility. Some of the sensors were miles away from the base. "We dug up about 30 or 40 of them on various access roads leading to the base on public land," Arnu says, insisting that he and Clark always carefully reburied each unit after logging it, and even tested it with the frequency counter to make sure it was still working before moving on to the next one. Based on their survey, Clark and Arnu have estimated that there are between 75 and 100 sensors, on public land used by hikers and photographers in addition to curiosity seekers. "I think it is absolutely inappropriate," says Arnu. "You have to understand that people going out there-- not everybody is interested in Area 51... They track these tourists on public land going about their hobby." When they'd gathered sufficient evidence that the Air Force was bugging the desert, Arnu and Clark revealed the road sensors on Arnu's website, Dreamland Resort, a forum and information site for Area 51 aficionados and the "Official Home Page of the world-famous Little A'Le'Inn." The reaction from the government was immediate, according to Arnu: the road sensors were fitted with a new feature aimed at better eluding detection. Now the transmitters would wait a minute or two before broadcasting an alarm, so that desert wardrivers are out of range before the transmission takes place -- at least, using relatively insensitive detection equipment like a frequency counter. Undeterred by the innovation, in June of last year Clark led a news crew from Las Vegas' KLAS television station into the desert and showed them some of the road sensors. The following week, according to the station's report, FBI and Air Force agents raided Clark's trailer home in Rachel, and carted off his computer, photographs and records. The next day, Arnu got a call at work from the FBI. "They demanded that I speak with them the very same day," he says. The investigation sparked something of a backlash in Nevada. The Las Vegas Review Journal editorialized against the FBI's tactics. In the Las Vegas Mercury, George Knapp, the newsman who filmed the KLAS segment, asked how far the government should be allowed to go in protecting the secret base. "If you or I accidentally kick one of these hidden transmitters, should the feds be able to seize our Macintosh and photos of Aunt Betty?" Arnu describes the probe as an intimidation tactic. "It didn't lead anywhere," says Arnu. "It was basically a dead-end from the beginning because we didn't break any law... We dug [the sensors] up without damaging them or destroying them." But court documents unsealed earlier this year reveal that there was an unsolved mystery lurking around Groom Lake. It seems that a month prior to the raid, one of the road sensors went missing-- vanished, like an abductee pulled into a flying saucer. The government didn't charge anyone with stealing U.S. property, but last December they charged Clark with a single count of interfering with a communications system used for the national defense. 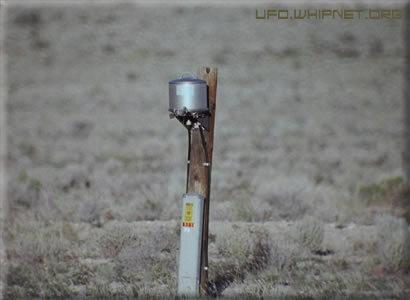 On March 12th, 2003 Clark allegedly obstructed, hindered and delayed "a signal from a mini intrusion device" located outside "the Nevada Test and Training Range" -- a reference to the government land that encompasses the Groom Lake site. "He removed one," says Natalie Collins, a spokesperson for the U.S. Attorney's Office in Las Vegas. "It says that there, so it's fine for me to confirm that." In a deal quietly reached with prosecutors last January, Clark agreed to "either locate and return the sensor removed on March 12, 2003 or pay restitution to the United States Air Force to replace the missing sensor." In exchange, the government agreed to suspend proceedings against Clark and to place him on a kind of probation called "pretrial diversion": if Clark goes a year without interfering with any of the road sensors, and doesn't otherwise break the law, the government will drop the felony charge. Clark's phone number is unlisted, and he didn't respond to repeated messages left for him at the Little A'Le'Inn over the course of several months, and inquiries passed through Arnu. Clark's attorney also declined to return repeated phone calls on the case. Arnu says his friend never told him about a missing sensor, or his agreement to return it. "I refuse to believe that Chuck would be stupid enough to remove one," says Arnu. "I know... that he agreed to lay low for a year." Clark's adventures near the most famously secret patch of real estate in the world appear to have pulled him beneath the very cloak of secrecy he poked and scratched at for so many years. He has, in a sense, become a part of Area 51.